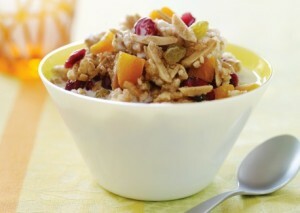 Mix flaxseed meal, wheat germ, almonds, chia seeds, raisins, Rice Krispies, oats, coconut, sunflower seeds in a large bowl . In a small saucepan on the stove, warm the honey & peanut butter till melted. Stir in the cocao till well mixed. Take off the stove and pour onto the dry ingredients. Mix all together well. Press down into a 9×13 inch pan and chill. 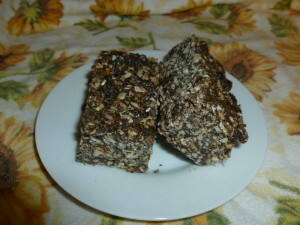 Cut into bars and eat! This makes a delicious, healthy snack! 2. Combine all ingredients into a large bowl. 3. Spread mixture in a thin layer on a cookie sheet. 4. Bake for 5 minutes and then stir with a spatula. 5. Bake another 5 minutes and then stir again. 6. Keep baking for about 15 minutes total until golden brown all over. 7. Eat immediately or cool for about 10 minutes prior to serving. •	Double this recipe and store it in an airtight container in the pantry. Enjoy it with milk or yogurt all week.